Next month, The World Transformed will be welcoming Jean-Luc Mélenchon to speak at its Labour conference fringe. The French politician who inspired the European left with his radical campaign for the presidency in 2017 won more than seven million votes. Since then, despite only commanding 17 MPs in the National Assembly, Mélenchon has emerged as the main resistance to the neoliberal ‘Jupiterian’ presidency of Emmanuel Macron. Comparisons abound between Mélenchon and Jeremy Corbyn. After the Corbyn surge of the 2017 election, one French magazine termed the Labour leader a ‘British Mélenchon’. Both are, of course, older white men leading a resurgent left in their respective countries. They are fellow socialist travellers across the channel – both were marginalised as neoliberalism took hold of their parties, with Corbyn emerging from the ashes in 2015, and Mélenchon quitting the Socialist Party (PS) in 2008 to form a new left, now in the ascendancy. But the real reason for Mélenchon’s invitation to TWT is not because he is Corbyn mark 2. No, it is for the same reason that TWT is happening in the first place: as part of a democratic socialist project to shift power towards the people. The fundamental truth about the two men’s successes is that it’s not about them. It’s about what they, and TWT, represent: the left taking hold of the future. Our alternative is predicated on the return of the social good, of public services run by and for the people. Socialist projects in the UK and in France aim to reverse the waves of privatisation pursued by right and left parties since the 1980s. Water, rail and energy are slated for nationalisation. Here Labour is going beyond Mélenchon’s FI. In offering regional public water companies and community-run energy systems, Labour is recognising that the historical conditions for statist social democracy no longer exist. Instead, it is building a new kind of socialism – a fusion of the state and local communities. This is the political space TWT occupies, building power on the ground while transforming Labour. As the title of one session led by John McDonnell suggests, we are both “In and Against the State”. Together, we’re inventing the future. But we can’t do it on our own in Britain. Without support from across Europe and beyond, a left government – whether led by Corbyn or Mélenchon – won’t be able to survive. Capitalism and its accompanying climate breakdown are not limited to one country – our response can’t be either. With speakers from over 25 countries, ranging from the leader of the German Linke, Katja Kipping, to a delegation of indigenous leaders from the Kayapó community in Brazilian Amazonia, TWT2018 will be a space where the international left comes together to share ideas and practices and build crucial links of solidarity. Corbyn’s Labour is a shining beacon to the left, in Europe and beyond. 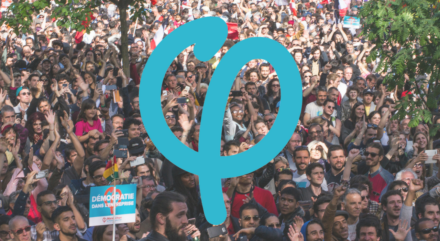 As parties across Europe, including the PS, suffer from Pasokification, a resurgent Labour demonstrates the need for a strong, socialist alternative to a decaying neoliberalism. Angus Satow is an organiser for The World Transformed. Tickets and programme information for The World Transformed can be found here: theworldtransformed.org.